If there is one thing that makes India's growth story patchy, it is its infrastructure. Within the infrastructure deficit, the lack of roads remains the greatest challenge. Although India currently has 3.3 million kilometres of roads - the second largest such network in the world - the shortage of highways has been a major hurdle for attracting foreign investment. Of the 71,000 kilometres of national highways, 16,000 are single-lane roads. So when Union road transport minister Kamal Nath spoke at the India Economic Summit to give an update on the highways, it came as an assurance that the road to recovery would not be on bumpy highways. Industry leaders, though, continued to have concerns on dispute resolution and land acquisition. Stating that the government was working towards decimating delays due to land acquisition, Nath said that acquisition of land for Work Plan II, which is a plan of the road projects to be awarded in the financial year 2010-11, will start soon. "We have reduced the land acquisition process to eight months from 18 months. I review the land acquisition process every three months and have also met the chief ministers, who have also shown interest," he said at the summit. He sent out three project directors, the field level contact of the project developers and the highways authority after finding that they were not working properly. "This will give you an idea of how serious things are," he added. Nath took over the reins at New Delhi's Transport Bhawan after an eventful stint as commerce and industry minister in the United Progressive Alliance government's first tenure. Then he was part of the stimulus rolling measures that were announced to counter the slowdown. After he joined the roads and highways ministry, he set a target of building highways at the rate of 20 km a day. 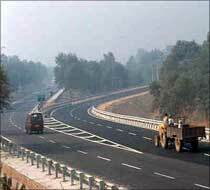 The minister also asked the National Highways Authority of India (NHAI) to come out with work plans annually. In Work Plan I, for the financial year 2009-10, the NHAI had planned to bid for 124 projects worth Rs 1 lakh crore by the end of this financial year. This will now not be possible and the deadline has been extended by three months to June. NHAI is a statutory body that is charged with the task of executing the seven phases of the National Highway Development Programme. The projects involve four- and six-laning and construction of expressways on the existing network of national highways. Nath said that the aim is to bid around 85 per cent of the total road projects on public-private partnership basis - 60 per cent through tolling (where the contractor builds roads and recovers his investments through collection of a user fee from commuters) and annuity (where the contractor builds roads and the government pays him money in installments). The slowdown had kept bidders away from projects and there was a lull in award of contracts. Issues of liquidity and adequate availability of funds became a concern. The government is trying to ensure that contractors have enough funds available to bid for the road projects. Nath said, "To address the financing issues of concessionaires, an empowered group of ministers headed by the finance minister and comprising me and the deputy chairman of the Planning Commission will look into the issues of financing of road projects." There were several issues raised by the participants present on the dais. The issues included the cost of projects and dispute resolution. "The government is doing a lot on the policy side to make sure that road projects pick up, but the issue of dispute resolution is not yet addressed," said Hindustan Construction Company chairman and managing director Ajit Gulabchand. The minister replied to this, saying that the government is looking at ways to resolve disputes on the field itself and in a worst case scenario they will go in for arbitration. At present, any dispute between the contractors and the NHAI goes first to the Dispute Resolution Board. If not satisfied with the decision given by the board, one can go in for arbitration. Apollo Tyres chairman Onkar S Kanwar suggested ways like single-window clearance to expedite road projects, adding that dispute resolution should have a time limit. "If we remove multiple authorities involved in the procedure, we will be able to build 30 km of roads per day," he said. Nath also said that the government would start offering large projects, which are 600 km or longer, to attract large companies interested in bidding in India. Government officials have heard from the world's largest construction companies that they will invest only if "mega-projects" - those valued at $1 billion or more per year - become available, which will attract the best technologies and best practices of international firms. The government wants to see 600 such mega-projects go forward in the near future.